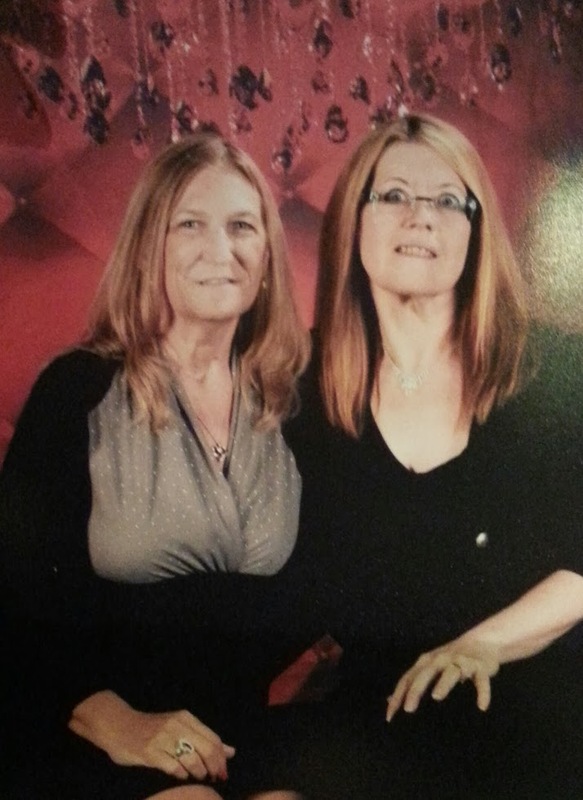 My first fun day at sea was over, and I slept like a baby on the second night of my “inaugural” cruise on the Carnival Magic with my cousin, Sharon. Tuesday, August 13, was my first port day. After all that time at sea, we had arrived in the exotic country of … the U.S.A.
By the time I woke up, we were already docked at Key West, Florida, and – Glory, Hallelujah – my Verizon 4G was working (and not roaming) again. We headed up to the Lido deck for breakfast before leaving the ship, and I had what was to become my standard morning fare on board a ship: scrambled eggs, fruit, and banana yogurt – a flavor that’s extremely hard to find at home (so I now always snag several on the last day of a cruise to carry home with me). 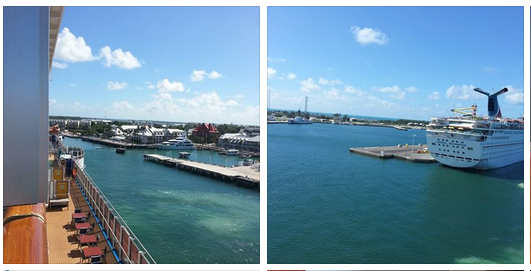 After breakfast, we took a few minutes to enjoy the view of Key West from the upper deck. The Carnival Imagination was in port with us that day, and there were some impressive yachts parked closer to shore. 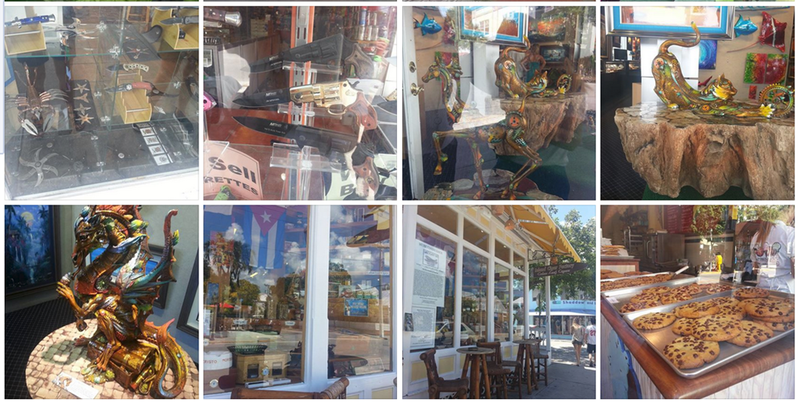 We hadn’t purchased any excursions for Key West. We had decided to just walk around town and see the sights, and it turned out to be a great decision. First, I wanted a photo in front of the Magic. At this point, I was still amazed at just how big she was – in fact, she was too big to get all of her in the picture. 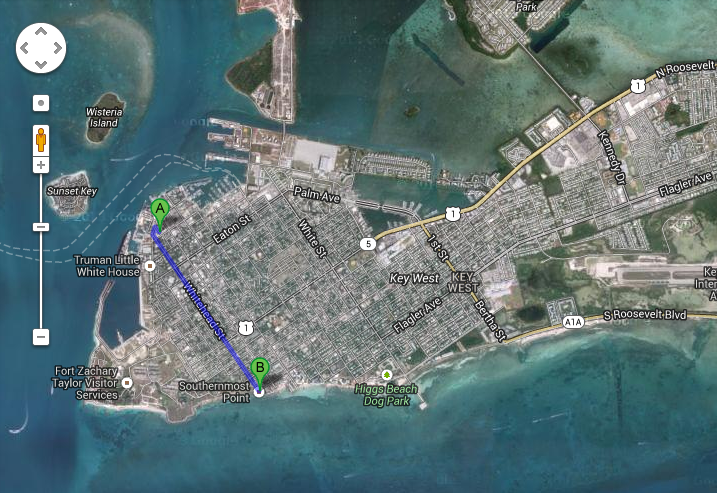 Key West isn’t a very large island, so we figured we could walk to wherever we wanted to go. First, we set off for the southernmost point in the United States, which is a little over a mile down Whitehead Street from where the ship was docked, as you can see on the map below. The nice thing about this walk is that there were plenty of interesting things to see along the way. The not-so-nice thing was that it was the middle of August and it was hot. I was glad I’d brought along a sun hat, but I was wishing I’d brought along a portable air conditioner. 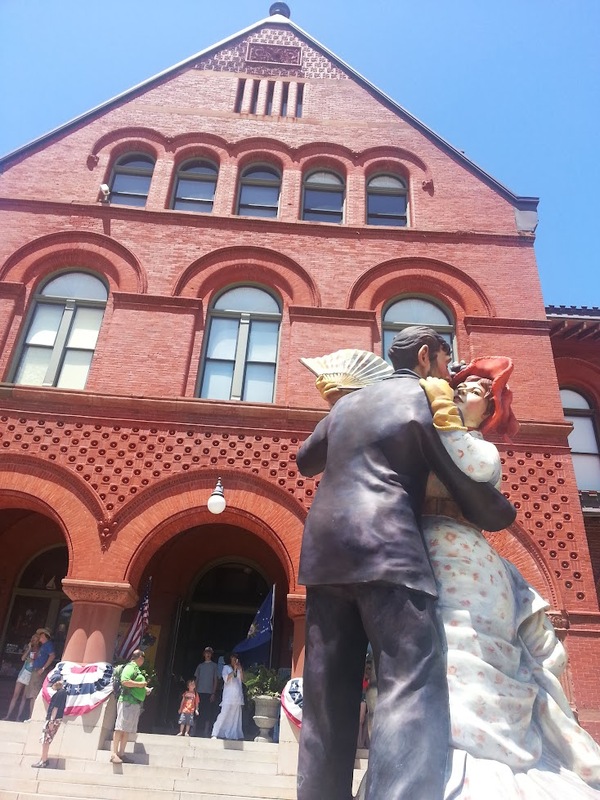 The statues of people in various poses in front of the Customs House are pretty fascinating. 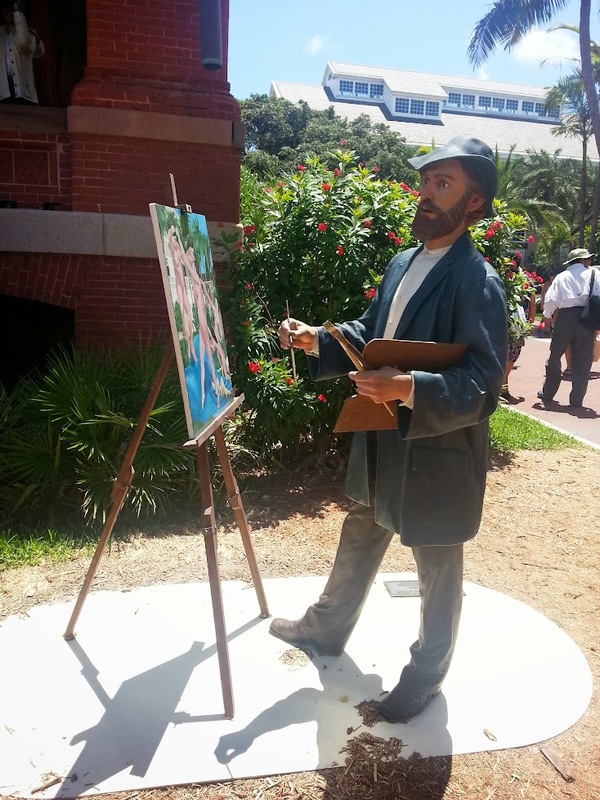 With some of them, you had to look twice or you’d think they were real people. 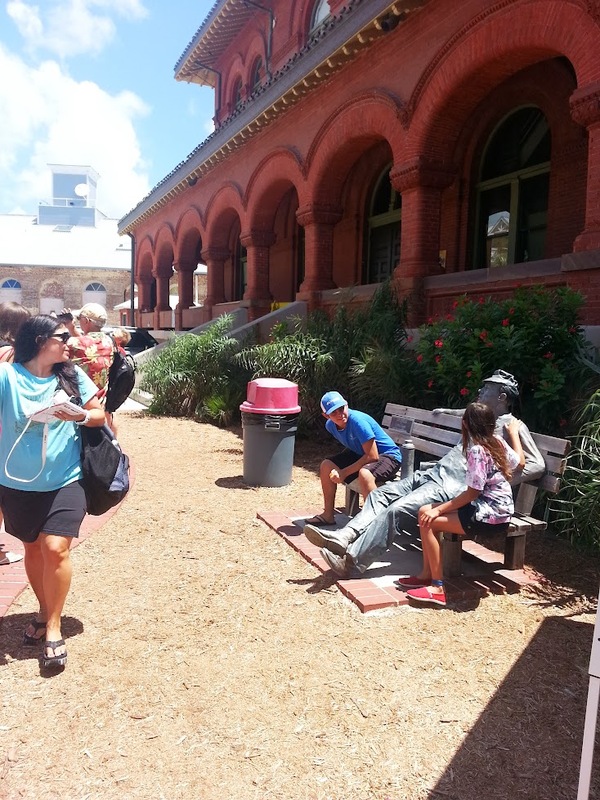 We stopped along the way at the Naval Air Station, the Hemingway House, the 1 mile marker, and had fun people-watching as we walked. We reached the Point and posed for the obligatory tourist photo with the marker. We crossed over one block to make our way back via Duval St. There were dozens of great little shops and establishments along that route, including the original Margaritaville. I had great fun window shopping, although I could never afford the $3000+ cat and dragon sculptures that I fell in love with, and Carnival’s policies would never allow me to bring the cool edged weapons I found back onto the ship. I could have bought one of those giant chocolate chip cookies, and they were mightily tempting, but I knew I’d be blowing my diet that night at dinner without any help, so I resisted. 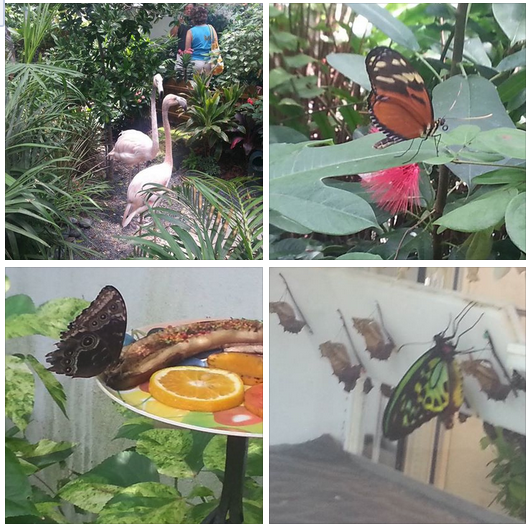 One of the most fun spots that we visited in Key West was the butterfly sanctuary on Duval. There were all sorts of beautiful big “flutter-bys” and they would land on your shoulder if you stood still enough. By the time we got back to the ship, we were tired but happy. 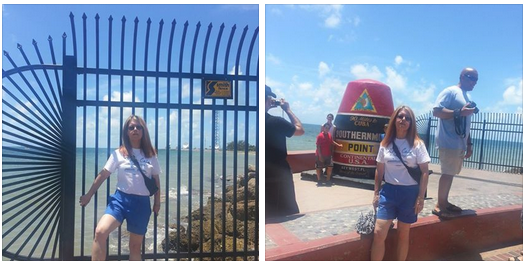 It had been a great day on Key West and we were starving and ready to get ready for an early dinner. Tonight’s dinner dress code was “cruise casual” so we didn’t have to get all dressed up, although after getting all sweaty out there in the heat, it felt good to shower and change. Before dinner, we went to find our photos from the night before. 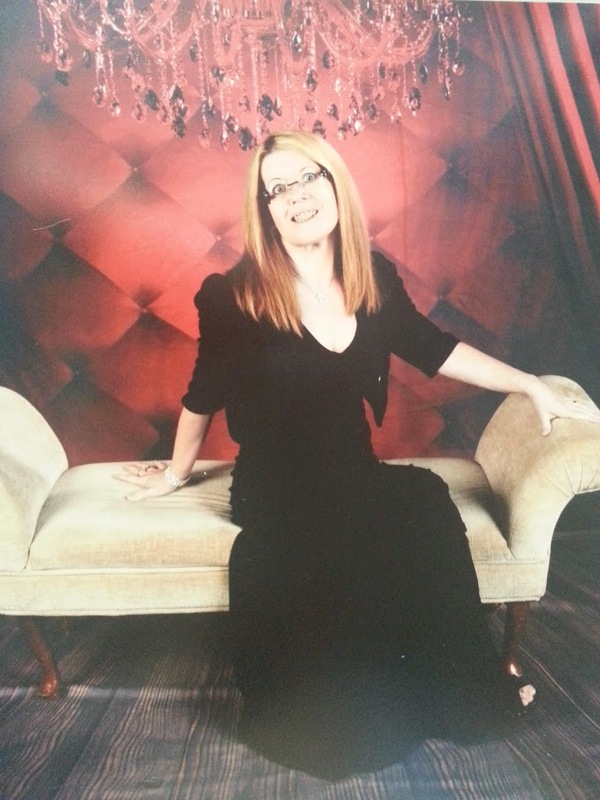 The pictures are all displayed on the photo walls on the 4th deck, and you have to hunt through hundreds of pictures of everyone on the ship (who posed for pictures) to find yours. We finally did, and I was pretty pleased with how well some of them turned out, so of course I ended up spending a bunch of money on them (at $20 each). Dinner was just as good as the night before (even without the double lobster). We got our same table and our waitress, Ria, again. This time we got a cheese plate that Tom would have enjoyed, and I got a turkey pasta dish as my entree. For dessert, I had the tiramisu, which in my opinion is much better than the WCMC, but I realize that statement is akin to heresy in certain circles. To each his/her own. After dinner, we ventured out for a few more photo sessions (in more casual clothing this time), and then decided that “if it’s not broke, don’t fix it” and since the comedy club proved to be such a success the night before, we thought we’d do it again. There was a different comedian there this time (first name Tommy; can’t remember the last name) and we caught both of his shows – the early “PG” version and the later “adu lts only” version. Both were funny and the latter, while some of the content was more mature, wasn’t the deluge of dirty language that marks so many of the “adult” comedy shows. And yes, I had another Bailey’s Banana Colada. Remember what I said before: I’m on vacation. By the time we got out of the club, I was ready to hit the sack, looking forward to my first visit to the Bahamas the next day.